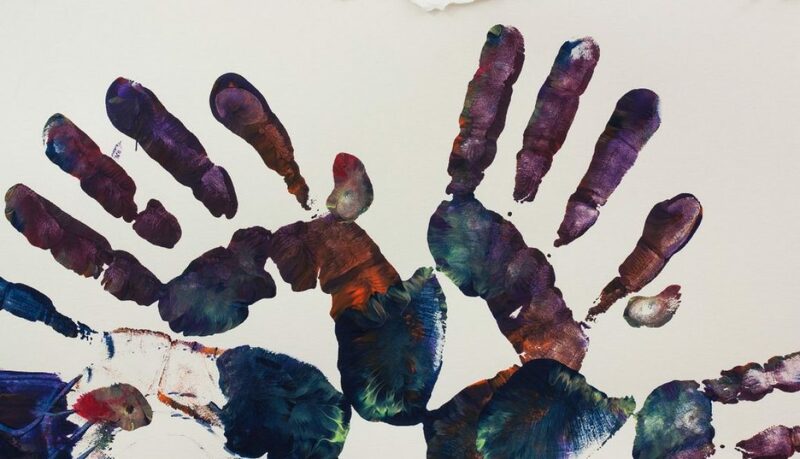 As an art therapist who works with young children, I sometimes encounter parents who are hesitant about about using art as a tool for child development. Reactions can range from, “So you just make art?” to “I can’t take mess eh”. It poses the question, what is “just” art? Can the process of art making be beneficial? Does it matter if my child is creative? Although some may regard art making and education as a luxury, simple creative activities can be considered some of the building blocks of child development. Many of the motions involved in making art, such as grasping pencils, tracing a line or scribbling with a crayon, are essential to the growth and development of fine motor skills in young children. This development will help your child with writing, buttoning a shirt, and tying shoelaces later on. Many preschool programs emphasize the use of scissors because it develops the skills children will need for writing. Making art, as well as describing and sharing it, provides opportunities for children to learn words for colors, shapes and actions. When toddlers are as young as a year old, parents can do simple activities such as crumpling up paper and calling it a “ball.” Art making can also be a great opportunity for children to learn new vocabulary words regarding their projects. Experiences in the arts go hand in hand with learning. Children can practice critical thinking skills by making a mental plan or picture of what they intend to create and following through on their plan. On a deeper level, art actually seems to have an impact on the brain’s neural connections, which act as the wiring for learning. The senses have to operate and deep thinking is a requirement. This leads to the development of skills such as recognizing the difference between abstract and reality, understanding patterns, and making observations about the world. Establishing social skills at a young age is incredibly important for regular development. Art trains children not just to focus on themselves but also on others. When children work together to create art, they learn to share, to interact with others, to be responsible for clean up, and to put materials away. They realise the importance of teamwork, and can appreciate differences between people and their individual perceptions. One of the main goals of art therapy is the use of art as an emotional outlet, however even casual art making can help children to develop and better understand their feelings. Being angry or hurt is not always easy to describe in words, but a child can put these emotions into a drawing or painting, and make it easy for themselves and others to comprehend. Getting their emotions out in a creative way can be both therapeutic and insightful. Things don’t always go as planned, and sometimes an activity may take longer to complete than expected. Opportunities to show children that by waiting you get a good result are excellent in teaching patience. What happens if your child’s sculpture accidentally breaks? Children are forced to deal with the imperfections of real life in a more controlled and comfortable environment, where they can practice skills in patience and flexibility. A more flexible child is happier, plays better with others, and finds ways to become even more creative. By selecting crafts that are age appropriate you are giving your child the opportunity to experience the feeling of accomplishment. Unlike the accomplishment of taking steps, or finishing a meal, art has a tangible prize at the end – the art itself. The child can look at it, hold it and show it to others. As children improve and see their own progress, their self-confidence will continue to grow. Art can also improve confidence by opening up dialogue about situations that may be hard to deal with or share. 1. Don’t be afraid of mess! To maintain your sanity, set up a designated art space where your child is free to experiment. Throw a tablecloth or a newspaper on the floor or on top of a table. If possible, let children paint outside. 2. Provide choices. Let your child decide what materials they want to use and how and when to use them. It can help to gather a wide range of materials for your child to use like paint, chalk, markers, crayons, oil pastels, scissors and stamps. Mix it up by bringing in unexpected materials like string, cotton wool, dry pasta or beans. 3. Avoid giving direction. Don’t dictate what your child should make or how they should make it. Instead, encourage them to experiment with mixing colours or using new materials. Let your child explore, experiment and use their imaginations. They might make a big mess or change their mind several times, but this is all part of the creative process. 4. Don’t give mindless compliments.When talking to your child about their artwork, try to be precise in your comments. For instance, instead of giving a generic compliment (“I love it!”), comment on the colours that they used (“I see you used a lot of green. Why did you choose that color?”). 6. Focus on the process, not the product. Encouraging your child in the action of unstructured art helps them work to express themselves freely, without worrying about what others think. If a lot of attention is given to the final product or you spend a lot of energy praising the result, a child may be more likely to do things to get your approval instead of doing what they want to do. Part of focusing on the process involves encouraging effort. Praise them for their hard work, not the finished product! 7. Don’t draw (well!) with your child.Instead of drawing your own picture, sit down with your child and imitate their actions. Make big scribbles, small lines or practice drawing circles. When parents draw something representational while a younger child is sketching, it can frustrate them. If your child is focused on what you are drawing or how “good” your picture is, they are less likely to be imaginative and creative on their own. It is better to support them while they create instead of giving examples. 8. Let it be.When a child finishes a piece, don’t suggest additions or changes. It’s important for a child to feel that what they have created is enough, even if it’s just a dot on the page. 9. Let it go. As long as a child is safe (not running with scissors or ingesting materials), let them explore. They may spend the majority of the time sharpening colored pencils instead of actually drawing with them. Children learn through playing, exploring and trial and error. When we give them freedom to discover, they are learning to create and experiment in new and innovative ways. 10. Most importantly…Have fun! Get messy, laugh, and enjoy this time with your children. Your inner child will thank you as well!